Accommodation of the eye - the ability to clearly see objects at various distances from the eye. Physiological mechanism of accommodation of the eye is that while reducing the fibers of the ciliary muscles of the eye is relaxation Zinn ligamentwith which the lens is attached to the ciliary body (see the Eyes). This reduces tension bags lens, and it is thanks to the elastic properties becomes more convex. The ciliary muscle relaxation leads to flattening of the lens. In Fig. 1 shows the scheme of accommodation of the eye (the solid line - the position of the lens at rest, dotted with accommodation). Innervation of the ciliary muscle is oculomotor and sympathetic nerves. Fig. 1. The scheme of accommodation of the eye. Fig. 2. The dependence of the volume of accommodation of age. Accommodation of the eye is possible within the limits allowed nearest and further points clear of view. The first is determined by the smallest distance, on which it is possible to read the fine print; second, the greatest distance at which clearly visible item in the absence of accommodation of the eye. The situation is further points clear of view depends on the refraction of the eye (see). Increasing the refractive power of the optical system of the eye, can be achieved with maximum voltage of accommodation of the eye, called a volume, or power, accommodation glazaaa accommodation of the eye changes with age (Fig. 2) due to the decrease of elasticity of the crystalline lens (see Presbyopia). To pathological changes include spasm, paralysis and paresis ccomodation eye. Spasm usually occurs in young people with long-term stress accommodation of the eye, injury, the effect on the eyes is very bright light. Patients ccomodation eye appears myopia. Paralysis and paresis ccomodation eye can be Central origin and subject to infections and intoxications. Peripheral paralysis ccomodation eyes see when injuries eyes ingestion of drugs atropine, in zacapawanyi in kongungualny bag of tools that extend the pupil. The paralysis of the eye characterized by an inability to discern the fine print closely. For treatment of acute and paralysis ccomodation eye patients may be taken to the doctor -ophthalmologist. Accommodation of the eye (lat. accomodatio - adaptation) is the property of the eye to change the refractive power to adapt to the perception of objects from him at various distances. The mechanism of accommodation of the eye is the following: while reducing fibers embedded in the ciliary body of accommodation muscle relaxes Zinn ligaments, through which the lens is suspended to the ciliary body; as a result, the lens having elasticity, becomes more convex shape and refractive the ability of the eye increases (Fig.). The relaxation of accommodation muscle fibers Zinn strained ligaments, lens flattens, and refractive power of the optical system of the eye is reduced accordingly. Accommodation of the eye may be exercised within certain limits, which depend mainly on the elastic properties of the lens. Closest to the eye the point that he is able to see clearly with a maximum voltage of accommodation, bears the name of the nearest point of clear vision; the most distant point, clearly visible in the absence of A. G., called further point clear of view. The linear distance between the nearest and further points clear of view, that is, space that century where the eyes can clearly see, call length, or area, A., the Change in the refractive power of the eye, which is achieved when the maximum voltage A. G., called a volume (the power of amplitude or wide) accommodation (expressed in diopters). With the age of accommodation of the eye changes as a result of gradual loss of elasticity of the crystalline lens and the ability to change its shape (curvature). 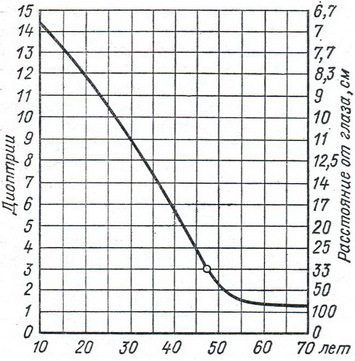 Age-related changes of volume A. G. shown in the table of Dangers. Accommodation of the eye: 1 - the lens by relaxing accommodation; 2 - the lens when stress accommodation. Listed in the table are average figures may vary in different individuals, but in relatively small. Age weakening A., leads to a gradual retreat from the eyes of the nearest point of clear vision, deterioration of conditions for examining near objects, to the development of so-called senile of view - presbyopia (see). Pathological violations ccomodation eyes are spasm and paralysis. Spasm A., occurs mainly in young people as a result of long-voltage A., and also injuries to the eyes and the effect on the eyes is very bright light. Clinically spasm A., manifested as myopia. Paralysis A., characterized by loss of the ability to see clearly near. Causes paralysis A., are mainly infections, intoxications and injuries.